It has been argued many times that syntactical movement, in the form of leftward extraposition and wrapping discontinuous constituents, is of such a crucial importance that there is a need to develop grammar formalisms aimed solely at a clear and concise treatment of these phenomena. Along the guiding lines of a number of examples of Dutch verb phrase structure, I first discuss head grammar (HG) and show that it inherently lacks the strong generative to describe even very simple fragments of complete Dutch sentences. 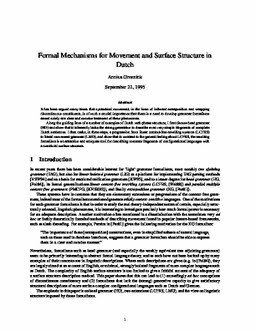 I then make, in three steps, a progression from linear context-free rewriting systems (LCFRS) to literal movement grammar (LMG), and show that in contrast to the general feeling about LCFRS, the resulting formalism is an attractive and adequate tool for describing concrete fragments of configurational languages with a nontrivial surface structure. Groenink, A.V. (1995). Formal Mechanisms for Left Extraposition in Dutch. In T Andernach, M Moll, & A Nijholt (Eds. ), Papers from the fifth CLIN meeting (pp. 73–90). Taaluitgeverij.